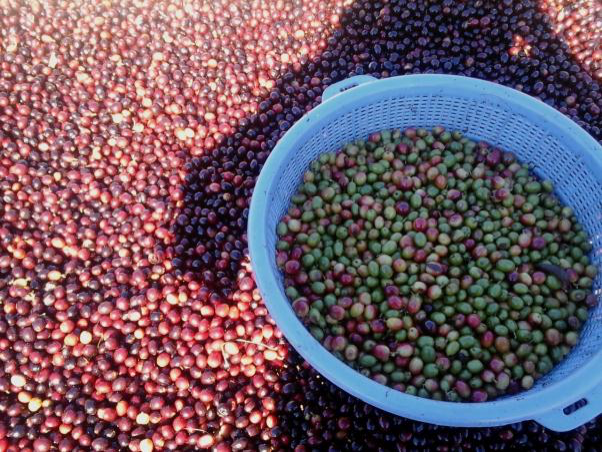 El Eden’s Mexican Guerrero comes to us from the El Eden Cooperative*, located in Atoyac de Alvarez, Guerrero, Mexico. Atoyac de Alvarez is located high in the jungle, approximately 200 miles southwest of Mexico City, nestled between the Pacific Ocean to the south and the Seirre Madre Sur Mountains to the north. Atoyac’s location, though difficult to access, is near optimal for growing coffee — dense jungles canopies, cool ocean water, and high altitudes (4,000 – 4,500 feet above sea level). El Eden is a beautiful community nestled into the foothills of Tiotepec (3,550 meters), Guerrero’s highest peak. Despite being only 30 miles from the Pacific coast, El Eden remains one of Mexico’s most remote locations due to the arduous 3 hour journey up the dense, forested mountain. Those who do make it to the El Eden, after taking in the stunning views, will notice the lack of a gas station, grocery store, running electricity (which stops at El Eden) and communication lines. Many residents still have homes warmed by burning stoves and lit solely by candle light. The community’s only line of communication to the outside world is a telephone booth that announces callers through a loudspeaker. El Eden has no permanent police department or mayor and most community members hold dual coffee and community roles. People live humble, dignified lives. The Atoyac cooperative, comprised of 15 independent members, is unique among Mexico’s coffee cooperatives in that growers’ pool resources and credit but never their beans. Each grower tends his own lot and each sets his own price. 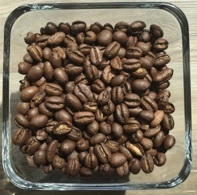 Given the El Eden community’s deep connection to their land, it is no surprise that this coffee is naturally processed and sustainable. The co-op, at one time, was certified organic but found the price of retaining the organic certification too steep and opted out of renewing their certificate; their practices, however, remain unchanged. Everything on the cooperative is done by hand. 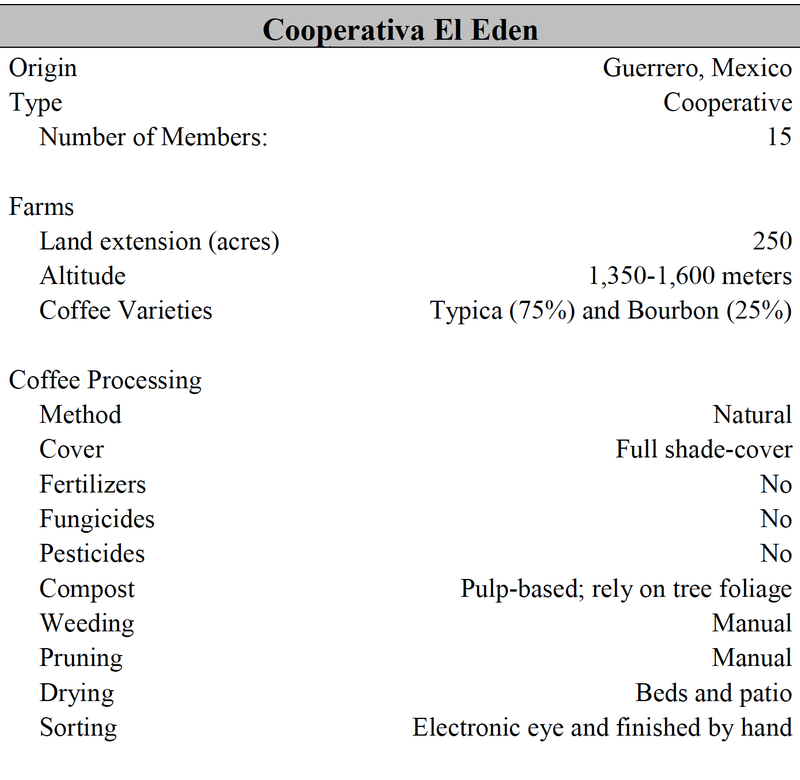 For more information about El Eden’s coffee, please see the chart below. Our bourbon beans come from the lot of Miguel Arrellano and are roasted to a full city shade. The brew has a wonderfully rich aroma, moderate mouthfeel, and molasses and walnut-toned base notes that finish with a bright blackberry close. This is a wonderful coffee with a wonderful story, don’t miss out! Click here to purchase! 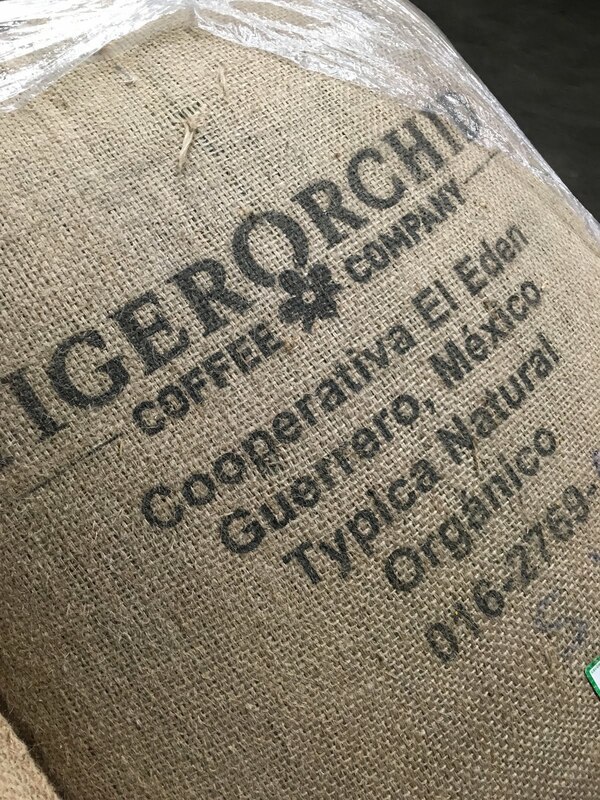 *The El Eden Cooperative partners with Tiger Orchid Coffee Company, a direct trade green coffee retailer, to ensure all co-op members receive continued education, resources, and a fair market price.